Samuel Hickmott was christened at the St Mary's Church of England at Lamberhurst on 5 May 1799. His parents were Thomas Hickmott (1769-1854) and Elizabeth Wibley (1766-1837). Thomas, who was also born in Lamberhurst, was the son of James Hickmott and the great grandson of John Hickmott, a yeoman farmer who lived initially at Horsmonden but, in 1722, moved with his wife and family to Lamberhurst thereby commencing that line of the family. Click here to read more about the lives and times of some of the early Hickmotts of Lamberhurst and their families and descendants. A pdf file of the known descendants of Thomas and Mary Hickmott (nee Masters) can be downloaded by clicking here. The Parish Chest records sighted by Dawn Miles indicate that Samuel worked for a T. Prickett of Lamberhurst for one year from Michaelmas 1812 for a retainer of one shilling per week (at the time, Lamberhurst comprised around '280 families and 1200 souls'). He then lived and worked as a labourer in the adjacent village of Pembury in Kent. During this time Samuel met a local girl, Harriet Hartridge, and married her in nearby Staplehurst on 25 January 1819 (the record of marriage states that Samuel and Harriet were 'both of this parish'). The marriage was witnessed by an Edward Hickmott (probably Samuel's brother) and Francis Bewsley. Harriet had been born at Pembury in 1803. She was the youngest daughter of James Skinner Hartridge (1755-1826) and Elizabeth Larkin (1756-1835). James was from Pembury, where the couple were married in 1778, while Elizabeth was from Tudely. They had ten children before Harriet, all born at Pembury between 1781 and 1800. Samuel and Harriet lived at Pembury after their marriage and had three children there: Edward (baptised on 4 February 1821), James (5 January 1823) and Henry (30 July 1825). Harriet died sometime after Henry's birth and Samuel married another Pembury girl, Eliza Tester, on 26 January 1829. Eliza also died while giving birth to their first child William and was buried at Pembury on 14 August 1830. She was only 22 years old. After Eliza's death, Samuel went back to Lamberhurst leaving the infant William in the care of Eliza's family. The local Parish Chest records show that Samuel placed his three older boys into the Lamberhurst Poor House on two separate occasions: first over Christmas 1833 and again between July 1834 and April 1835. These times may have coincided with gaol sentences he and his older brother, Thomas Hickmott, served during this time for vagrancy and neglecting their families. Also present in the Poor House were a number of other members of the Hickmott clan including Jane Hickmott, the wife of Thomas, and her five children. In spite of the families' parlous financial circumstances it is possible that Henry and his brothers and cousins received a basic education, initially in the poor house, where children were said to be 'well instructed and conducted', and, on leaving, at the Lamberhurst National School. After being granted a sum of �10s and a bedstead by the trustees of the Poor House in April 1835, Samuel removed his boys and took them to live with him at Tunbridge Wells (in a cottage at Windmill Field where a brick maker James Goldsmith and his wife and daughter also lived). On 28 March 1837, Samuel and Thomas were convicted in absentia for stealing three lambs, valued at � from the property of Thomas Ash a tenant farmer from the Parish of Brenchley in Kent. The lambs, which actually belonged to a Sussex farmer, Samuel Pix, had been killed in situ three days earlier and their skins thrown into an adjacent field where they were discovered by Ash's bailiff William Austen. Ash took the skins to the Tunbridge Wells police station where they were identified by their owner. Acting on 'information received', Pix and the police superintendent, John Thompson, searched the house of Thomas Hickmott where, according to subsequent court statements, they found a 'quantity of lamb or mutton' hanging in one of the bedrooms. They then went to Thomas' place of work but found he had left a few minutes before their arrival (and never returned). Another policeman, John Start, was despatched to the house of Samuel Hickmott where he found 'a quantity of mutton cut into small pieces amounting together to about 15 to 20 pounds weight' but, again, no Hickmott. Not everyone, it seems, had it in for the brothers. Two local butchers were employed to fit the meat to the skins and, on achieving this, warrants were issued for the brothers' arrest. 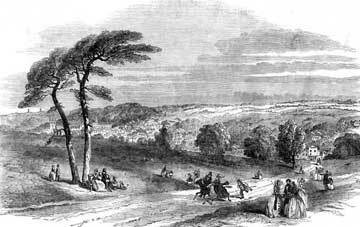 Thomas and Samuel were not apprehended however until December 1839 when, following another tip-off, they were apprehended by Thompson at the 'Brighton Railway'. They were brought before a local magistrate, Robert Willis Blencowe Esquire, on 6 December 1839. In his statement to Blencowe, Thompson reported that when arrested, 'Samuel Hickmott wanted to know why I took them into custody'. Thompson told them who he was and then said 'now you know I suppose'. Samuel was said to have replied 'Yes but I am innocent' and Thomas the same. When asked what each had to say in their defence, Thomas declared 'I have not got anything to say. I know nothing about it. It was not found in the premises I occupy, but in a room which I let to William Wood who is out at nights'. Samuel's defence was simply that he 'bought the meat in London, and have bought many a store there'. In spite of these protestations and character references provided by a Mr Wibley for Samuel and Mitchell for Thomas, the two brothers were committed for trial at the Kent assizes in Maidstone on 2 January 1840. Thomas' prison record together with his 'notoriously bad character' meant he attracted a life sentence to be served in the penal colony of Van Diemen's Land. Samuel whose character was merely 'bad' was sentenced to ten years transportation to the same place. The Magistrate's proceedings and Hulk prison register (described below) record that Thomas and Samuel were both labourers and that neither could read or write. Their convict indent papers state that Samuel was a ploughman, 5 feet 6 inches tall, of florid complexion with hazel eyes and black hair and a black beard which, like those of his descendents, was turning prematurely grey. It further states that he was married, although there is no indication of who to. Thomas, too, was described as a ploughman. He was taller than Samuel, had blues eyes, a dark complexion, black hair and beard, and a tattoo on each arm: on his right, an 'African women holding two hearts' and, on his left, a 'star flag and heart'. The ship's indent further indicates that Thomas had served in the British Army, in the 20th Light Dragoons, possibly in Spain. The UK Prison Hulk Registers and Letter Books, 1802-49 show that Samuel and Thomas were initially incarcerated on the prison hulk, Warrior, which was moored at Chatham in Kent. The ship's register of prisoners shows that Samuel (39) and Thomas (46) had been convicted at Maidstone on 2 January 1840 for stealing three lambs, both were labourers who could neither read nor write, and both were married with four children. The record added that Thomas had been convicted on four previous occasions - once for felony, twice for misdemeanours and once for poaching - his character was 'notoriously bad' and his disposition (presumably at the hulk) 'orderly'. Samuel had twice been convicted for vagrancy and was said to be a bad character. The two brothers were held on the Warrior from 14 January to 17 April 1840 when, with a number of other convicted criminals, they were marched, probably in chains, to the coastal town of Sheerness where they boarded the Asia. This was a two-masted sailing ship of 536 tons. She had been built at Aberdeen in Scotland in 1819 and had ferried convicts to Australia on eight previous occasions. This time the ship would depart from Sheerness on 27 April 1840 with 276 male prisoners. These were all from the labouring and working classes and were largely English in origin. Among their number were nineteen from Kent, seven, including Thomas, who had served in the British Army, a gentleman's servant from Poland, a shopman from Copenhagen and a clerk from Florence in Italy. Prior to their embarkation, the brothers would have been thoroughly washed, issued with new clothes and inspected by the ship's superintendent-surgeon, a James Wingate Johnston formerly of the Royal Navy, to ensure they were fit enough to travel and had no infectious or contagious diseases (Johnston's report indicated that the health of each man was 'good'). Since they were allowed by the authorities to do so, it is possible that Samuel's son Henry and his brothers travelled to Sheerness and came on board the Asia to bid their father farewell. This experience would certainly have discouraged the boy from any future life of crime, but may have also predisposed him to travel to the colonies to join his father if and when the opportunity arose. Click here to read about Henry's life and times. On embarkation, the prisoners were divided into small groups or 'messes' of around six men and issued with their bedding, comprising a rough, straw-filled mattress, a pillow and a blanket, and two wooden bowls and a wooden spoon to eat with. The prisoners were required to elect their own mess captains who were responsible for the orderly conduct of the group and for drawing its rations. Since the policy was to keep people with the same regional or ethnic backgrounds together in order to reduce friction, petty stealing and 'mutinous behaviour', it is likely that Samuel and Thomas would have been in the same mess. Thomas' age and military service may also have led him to have been made the mess captain, and given other supervisory or quasi-constabulary duties by the ship's authorities. The stench of the prison, crowded with perspiring humanity, was indescribable, and even to prisoners inured to the fetid atmosphere of the unsanitary gaols and hulks it must have been well-nigh unbearable, particularly in the tropics. The acrid smell of stale bilge water and of mouldy, rotting timber mingled in the still air with the foul odours of closely-packed humanity, and the wonder is that so many prisoners survived the experience, not that so many died under such appalling conditions (p. 72). 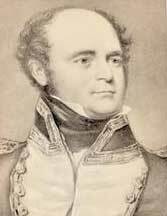 These appalling conditions notwithstanding, the prisoners on the Asia I fared much better than many of the other 51,000 convicts who made the long and sometimes perilous journey from England to Australia between 1831 and 1840. Only two convicts died during the 101-day voyage which was a little shorter than the norm and would have been shorter still but for the 'inclement winds' that delayed the ship's passage up the Derwent River. The Asia docked at the port of Hobart Town on 6 August 1840. Its arrival was announced in the 11th August 1840 edition of the Colonial Times as follows: 'Aug. 6. Arrived the barque Asia, 537 tons, Fawcett master, from Sheerness, 27 April with 274 male prisoners. Surgeon Superintendent J. W. Johnston RN formerly of HMS Sulphur; Guard Lieutenant Joyce, 50th Regiment; Ensign Otway, and 30 rank and file, 51st Regiment'. Needless to say, the paper gave no details of the convicts on board. This we thought was an ominous reception. We had hardly our feet on the soil, when almost the first objects that greeted our vision, were gibbets, and men toiling in the most abject misery, looking more degraded even than so many dumb beasts. Such sights, and the supposition that such might be our own fate, served to sink the iron still deeper in our souls (cited in Anderson, 2000: 166). Constructed in 1820, the Tench stretched along Campbell Street from the corner of Bathurst Street at one end to Brisbane Street at the other. Covering some two acres of land it was surrounded by a high brick wall on top of which were cemented jagged pieces of broken glass. At the Brisbane Street end stood the prison chapel. In the centre of the complex, opposite the main gates, was the residence of the prison superintendent William Gunn. At the end opposite the chapel were the cook house and mess halls in which the prisoners and others were fed. The remainder of the space was taken up with assorted office and cell blocks, prison dormitories, exercise yards, the prison hospital and the dreaded treadmill; an enormous circular structure that was powered not by horses but convicts under punishment and was used to grind flour for the prison and other government bakeries. As the prison barracks served also as a penitentiary, hiring depot and dormitory for workers employed by the town engineer, it held, in addition to the new arrivals, convicts and soldiers serving punishments, ticket-of-leave and other pass holders who were unable to find employment, and a range of mechanics and other artisans who were employed on public duties. Designed initially to house 300 inmates, the gaol's capacity was increased in the late 1820s to around one thousand. By the time of the brothers' arrival more than 1500 people lived and worked there. You have been sent here for various periods of time, varying from seven years to the term of natural life; and you are sent here for punishment. You will therefore, submit to whatever treatment you may be subjected during your respective sentences without murmuring or complaint (cited in Pybus and Maxwell-Stewart, 2002: 77). Samuel and Thomas' prison records indicate that they were not sent on to one of the newly-created probation stations but remained instead at the 'Tench' (the 1841 convict muster indicates that while Samuel remained at the prison, Thomas was then 'employed [at the] South Port party'). They were both initially designated as third class prisoners and so would have worked in the chain gangs that broke and hauled rocks for the roads in and around Hobart. There they would have suffered the same privations, hunger pains and feelings of exhaustion, and witnessed the same incidents of bullying, bashing and brutality, as all the probation period convicts. Probably because of his Army service, Thomas was eventually made a first class prisoner and given a supervisory role over his fellow prisoners. Samuel remained in the third class gangs and while it seems he avoided the lash and a stint at Port Arthur, he was sentenced to three days solitary confinement for misconduct. This saw him incarcerated under the chapel in a cell which was described by one of the American prisoners as 'a vault without light, with an uneven floor flagged with stone, and without any room for standing erect...two feet wide and six in length, ventilated with irregular crevices in the wall...the filth of these dens of infamy surpasses all description' (Lyon cited in Anderson, 2000: 170). Samuel was put into the local prison barracks for a probationary period that was initially 15 months but was extended to 3 January 1842 after he was found guilty of misconduct (for which he served the three days of solitary confinement). 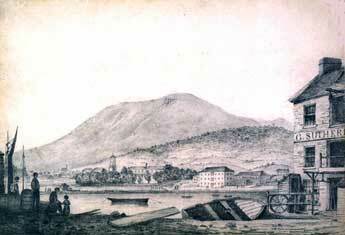 On 14 November 1845, he and Thomas were assigned to work for a David Jamieson Esquire at Hamilton in central Tasmania. Samuel received his ticket of leave on 12 June 1845, and he and Thomas began working for a James Turnbull at New Norfolk just north of Hobart. While there, Samuel married Susan Piccup in the St. Mathews Church of England on 3 January 1848. The wedding certificate records that both parties were of 'full age' and were employed as servants. The ceremony was witnessed by Thomas and a Rachel Wilden both of who, like Samuel and Susan, signed the certificate with a 'mark'. Samuel received a conditional pardon on 22 August 1848, and his certificate of freedom on 9 January 1850. The list recommending his pardon showed that Samuel had been six and three-quarter years in the colony and had 'completed seven and one half years of his sentence of 10 and only one record against him and that of a trivial nature'. In around 1853 Samuel (presumably accompanied by Susan) sailed from Tasmania to South Australia where they joined Samuel's youngest son Henry and his family (Henry and his wife Sophia, and two small daughters had emigrated there in 1849). The evidence for this was obtained by Wal Jenkyn, one of Samuel's great-great-great-grandsons. Checking through a transcribed list of rateable 'inhabitants of [the] Meadows District Council area [comprising] the four District Councils of Echunga, Clarendon, Macclesfield and Kondoparinga', Jenkyn found that the 1853 inhabitants included a Henry and a Saul Hickmatt [sic]. Noting that 'the typed listing had the warning that the original documents were very hard to read so spelling mistakes were very likely in the copied lists', Jenkyn concluded that Hickmatt was probably Hickmott and Saul was probably Sam'l. Samuel's presence in the area is supported by a number of advertisements, published in the Adelaide Observer in late 1856, in which he offered a reward for information leading to the recovery of three bullocks that had gone missing 'from the Meadows' (Henry and his third wife, Harriet, were married at Meadows in 1853 and their first son, James John Hickmott, was born there the following year. On 10 January 1857, Henry posted in the Observer a similar advertisement to that of his father. It seems that Samuel's brother, Thomas, also travelled from Tasmania to South Australia. This is evidenced by: 1) entries in the South Australian Gazette which showed there was an unclaimed letter held for each at the Adelaide General Post Office in August 1860 and February 1859 respectively; 2) a report in the South Australia Register in January 1862 which stated that a 'John Ramsey, licensed storekeeper of the Meadows...[was] charged [at the Strathalbyn Court] with having sold to Thomas Hickmott a quantity of wine less than two gallons' (the charge was dismissed after the defendant showed the wine was the produce of his own vineyard); and 3) a report in the South Australia Advertiser on 11 February 1859, of an inquest into a bush fire that destroyed a number of properties and grassland in the area of Watergate near Macclesfield and Meadows. The report included testimony by an Emma Lloyd who told the commissioners: 'Our family have always been in good terms with the neighbours with the exception of Mr Hickmott, and we have not been long unfriendly with him. The first person to put the fire out on the previous Monday was Mr Hickmott'. By the time of Thomas' court appearance, Samuel had left South Australia and travelled to Victoria (perhaps again to join Henry who had taken his family to the Bendigo goldfields in around 1856). Our next record of Samuel is as the informant for his wife Susan's death certificate. She had died of a 'serious effusion on the brain' at Inglewood (near Clunes in Victoria) on 1 July 1861 and was buried at the local cemetery on the same day. Her death certificate records she had been in the colony for 14 months (suggesting that she and Samuel had left South Australia in around February 1860). Samuel seems to have left Inglewood soon after his wife's death. The Victorian Government Gazette, dated 20 July 1861, shows that the general post office then held an unclaimed letter for a 'Saml Hickmott [of] New Inglewood'. Our next record of Samuel is in the Victorian Goldfields hospitals records of admission which show that a Samual [sic] Hickmott, a labourer aged 72 years, was admitted to the Maryborough and District Hospital on 18 January 1872. He was recorded as being single, a Wesleyan and a resident of Maryborough. His port of embarkation had been Hobart Town and he had been in the colony (of Victoria) 18 years. Unfortunately the record doesn't indicate how long Samuel stayed in hospital, it merely notes that on discharge, he was 'sent to his friends'. It is probably of no coincidence that Henry and his family were also at Maryborough around this time. The local Rate Books show that, on 21 November 1871, Henry paid eleven shillings and threepence in rates for a wooden house on Dundas Road (the house was owned by a D. Taylor). There was no mention of him in subsequent (or previous) records. This suggests that he and his family lived briefly in Maryborough around Christmas 1871 prior to taking up land in Charlton the following year (his obituary suggests that they may also have lived at some stage in St Arnaud). Margaret Witte tells us that a Samuel Hickmott held a Crown Licence (No. 2824) for a 72-acre block of land at West Charlton which was forfeited, under the provisions of the 1869 Land Act, in 1876. This may have been our Samuel or it may have been his grandson, the second son of Henry Hickmott and Harriet Waters, who, together with his mother was killed by a lightning strike at Charlton in 1877. Whoever it was, we have not to date been able to discover where or when the older Samuel died or is buried. The search continues. What of Samuel's brother, Thomas Hickmott, and his family? Thomas' convict indent papers show that after release from prison in September 1842, he worked with his brother Samuel for both David Jamieson and John Turnbull. After Samuel was pardoned, Thomas continued working for Turnbull and, for a time, for a John Doran also of New Norfolk. During this time, he was convicted and sentenced for a number of minor offences receiving: 24 hours solitary confinement for being in a public house in New Norfolk on 29 October 1846; six days hard labour on 20 March 1847 for being 'out after hours in [the] company of a common prostitute'; and, on 2 August 1847, seven days imprisonment and hard labour for being out after hours and in a public house. After his third bout with the law, Thomas either became more respectful for the law or better at not falling foul of it for he received no further sentences and was granted a conditional pardon on 30 March 1852. Thomas' death certificate, described below, indicates that he remained in Tasmania until around 1856 when, as described earlier, he joined his brother Samuel in South Australia. Sometime after 1859 he also moved to Victoria where he died of 'influenza accentuated by old age' at the Warrnambool hospital in the southwest of the colony on 23 August 1871. His death certificate records he was then 77 years old, had been born in Kent in England, had spent 15 years in Victoria and 17 years in Tasmania, and was 'not married'. Thomas was buried at the Warrnambool cemetery on 26 August 1871. What of his wife and family in England? Dawn Miles' research indicates that in 1834 Thomas' family, who were then lodged in the Lamberhurst Poor House, comprised his wife Jane (31) and children: Ruth (7), George (5), William (3), Harriett (2) and Henry (1). She adds that 'they remain in residence [at the Poor House] for over a year until discharged on 14 April 1835. His family [moreover] have lived away from Lamberhurst for some time, as only Ruth and Henry (the eldest and youngest of the children) were baptised in Lamberhurst and the marriage of Thomas and Jane also took place away from the parish. Two year old Henry died and was buried in Lamberhurst on 29 August 1835 but at the time was noted as residing in Tunbridge Wells' (we know from their court records that Thomas and Samuel were living at Tunbridge Wells in the late 1830s). Ruth's age suggests that Thomas and Jane were married sometime before 1827. Ancestry's London parishes database shows that a Thomas Hickmott and Jane Froud were married at the Church of Saint Mary at Newington in Surrey on 19 October 1824. Their record of marriage shows that Thomas was a widower and Jane a widow (if this is our Jane, her maiden name may have been Taylor - see below). While Jane signed the register, Thomas simply made his mark. The 1841 census shows a Jane Hickmott (aged 45) and a Henry Hickmott (15) living at 'Bow Peep' Row in Pembury in Kent. The Head of the house was an Elizabeth Taylor aged 70. It is possible that this Henry was Samuel's youngest son. The UK censuses show that Jane lived the remainder of her life in the Pembury Alms House, initially with her mother and then by herself. The local parish records show that she died at Pembury and was buried there on 29 August 1873. Her death certificate states her cause of death was 'senile debility'. Unfortunately it casts no light on who her husband was saying only that she was the 'widow of _ Hickmott a farm labourer'. The 1841 census indicates that Jane and Thomas' eldest daughter, Ruth, was then working as a domestic servant in Tunbridge Wells while two of their other children, William and Harriet, were residing in the Tonbridge Union House. We have not as yet been able to trace their subsequent lives with any certainty although the Catherine House records show that a Ruth Hickmott was married in the Dorking district of Surrey in the April quarter of 1847 (vol 4, page 101). Her wedding certificate, contained on Ancestry's Surrey Church of England Marriages, 1754-1937, shows Ruth's husband was Thomas Edward Glover, a shoemaker and son of Edward Glover, also a shoemaker of Dorking. Ruth's father was said to be Thomas Hickmott who was a brickmaker by trade. The 1851 census has Thomas (30) and Ruth (24) living on the High Street in Maidstone. Also present was a 19 year-old Thomas Hicket where all three were said to have been born at Tunbridge Wells. The 1961 census has Thomas and Ruth in Lambeth in Surrey together with Thomas' nine year-old niece, Sophia 'Baines' or Raives'. Thomas' birthplace was said to be the Strand in London while Ruth's was Staplehurst in Kent. The LDS database has a Ruth and Thomas Glover, born in England in 1827 and 1821 respectively, living at St Louis in Missouri in the United States at the time of the 1881 census. The 1900 census shows the widowed Ruth, aged 73 and born in England, boarding a William and Priscilla Ross and their daughter Edna (who was born in St Louis in 1877). The census return indicates Ruth had emigrated to the US in 1869. A Ruth Glover, born in England in around 1828 and living in St Louis, died there on 6 November 1904.